Cyndee L. Allert - Dughi, Hewit & Domalewski, P.C. Cyndee L. Allert joined the firm in 2013 and was made a partner in 2016. She is one of our litigation attorneys, with a decade of experience defending complex personal injury matters, including medical malpractice, products liability and general liability. She handles all aspects of litigation, from pre-trial discovery and developing litigation strategies to trial preparation, trial and appellate advocacy. 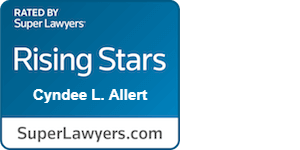 Ms. Allert is a member of the New Jersey State Bar Association and since 2016 has served as Secretary of the NJSBA Medical Malpractice Special Committee. Ms. Allert served as a judicial law clerk to the Honorable Richard C. Camp, J.S.C. in Essex County. She has also served as Court-appointed counsel to alleged incapacitated persons in Guardianship actions. 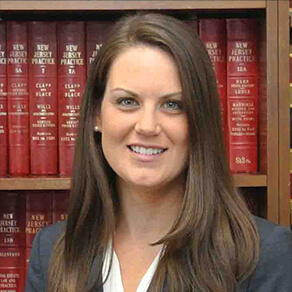 Ms. Allert is admitted to practice law in New Jersey, New York, The United States District Court for the District of New Jersey, and The United States Court of Appeals for the Third Circuit. She graduated from Seton Hall University School of Law in 2006 and received her undergraduate degree from the University of Maryland in 2003.